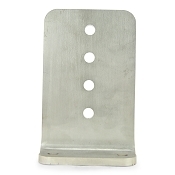 These Vertical L-Shape Bunk Brackets Mount on 3 x 3 Crossmembers for heavy duty carrying capacity for medium to larger boats, most commonly mounting in pairs to support larger vertically placed bunk boards, available in Aluminum and Hot-Dipped Galvanized in several heights. 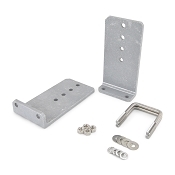 You will also typically need to replace the U-Bolts that mount these Bunk Brackets to your Trailers Crossmembers. Each Listing will have a link to the appropriate section if you also need to purchase U-Bolts to finish your project! 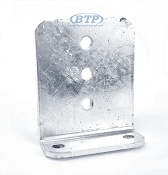 The Most Common size Square U-Bolt used with these Bolster Brackets would be a 1/2" x 3 1/16" x 4 5/16". This size U-Bolt is meant to mount around a 3" x 3" Crossmember and fit into the bottom two holes in the L-Shaped Bunk Support. Keep in mind you will typically also need to replace the Mounting Bolts that hold your bunks and support them within the Bracket. You will want 1/2" Diameter Bolts. We have these in the Trailer Bolts section in either Stainless Steel or Zinc Plated. 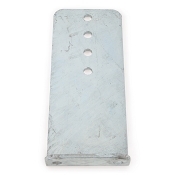 We have these L-Shaped Bunk Supports in either Hot-Dipped Galvanized or Aluminum. Both of these options are ideal for all types of Boat Trailers. 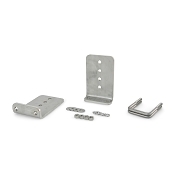 Typically the Galvanized Brackets would be best fit with Galvanized Cross Beams and Galvanized U-bolts, while the Aluminum Brackets would be ideally used with Stainless Steel U-Bolts on an Aluminum Cross Beam.